It will also be vital to keep the fuel flowing into the tractors, and power the pressure washer, and light the security lights, and all the other essentials of an average arable farm. 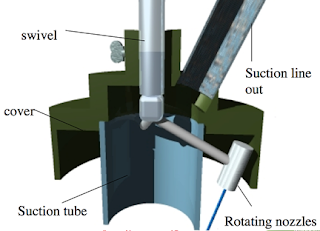 It is an indication of how far the use of pressurized water has come, that it is now seen, at the lower end of its application, as a vital farming tool. Which is a good introduction to talk a little further about the use of cleaning streams, and how to interact with differing target materials. There was an initial first step, when someone would send the lab a mystery block of material and asked – how do I cut it? Generally the samples were small, but we would find a flat surface on the material, and carefully point a jet nozzle perpendicular to this surface. (In the early stages this was hand-held). When a jet strikes a surface, but can’t penetrate it, then it will flow out laterally around the impact point, under the driving force of the following water. The test began with the jet at low pressure, and this was slowly raised, until the point was reached when the pressure was high enough to just start cutting into the material. At this point the jet had made a small hole in the target, and so the water flowing into that hole had to get out of the way of the water following. The sides of the hole stop it flowing laterally, and so it now shoots back along the original jet path. This spray can hit the lance operator if the nozzle is hand-held, but it is a fairly graphic way of determining the threshold pressure at which the material starts to cut. (and I’ll get into what happens as the pressure continues to go up in a future series of posts). 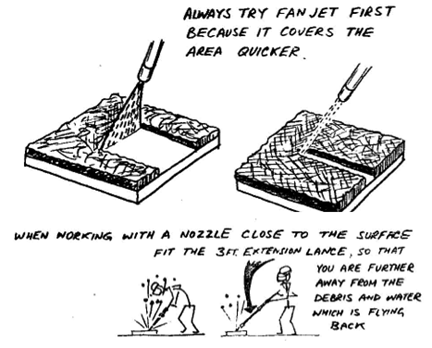 But for the purpose of cleaning, the jet has to move over the surface, once it has made that initial hole, at pressure. But, in many materials, if the jet comes vertically down onto the target, then only the material directly under the jet will be removed. And so the jet has to be played on every square inch of the surface in order to ensure that it is cleaned, or that the coating/layer is removed. In some sandstones, for example, two jet paths could be laid down, almost touching one another, and yet the rib of material between them would remain standing. Figure 1. 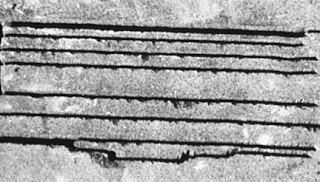 Adjacent jet passes in sandstone, the cuts are about an inch deep, but note that even though the narrowest rib is about 1/8th of an inch wide, it is only when the cuts touch that the intervening material is removed. Yet that rib of material was, in that case, so weak that it was easy to break it off with a finger. (This turns out to be a weakness in making delicate sculptures out of rock). To use the full pressure of the water can be a waste of energy, if the material is very thick, since it all must be eroded with such a direct attack. Yet the minimum amount of material that needs to be removed is that that attaches the layer to the underlying material (the substrate concrete, steel etc) and this can be quite thin. Thus, in attacking a softer material, particularly one that can be cut with a fan jet, a shallow angle directed at the edge of the substrate can be more effective. Because there is a balance between cutting down through the material to be removed, and cutting along the edge to grow the separation crack between the materials, some practice is needed to find, for a given condition, what that angle would be. 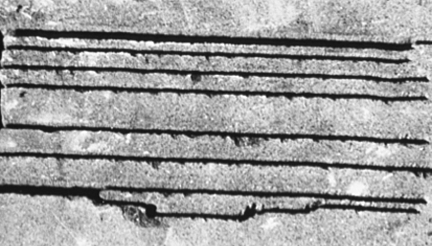 The more brittle the material, then the greater the angle to the surface, since rather than just erode the material, the jet may also shatter the layer into fragments that extend beyond the cut path. 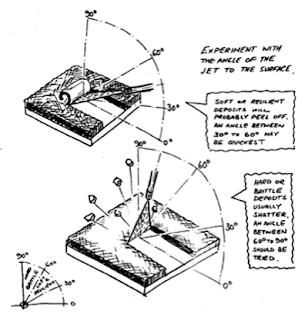 But otherwise using an angled jet to the surface can be more effective. Hughes (from whose paper at the 2nd Waterjet Conference I took these illustrations) has a simple test for orifice choice. Some of the more advanced cutting heads use a series of nozzles that spin within an outer protective cover, as they remove anything from layers of damaged concrete to thin layers of paint from ship hulls. Increasingly these are connected to vacuum systems that will draw away the spent water and debris from within the contained space, without it entering the work space, and creating problems for the worker. 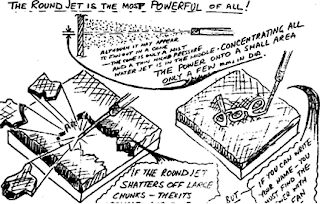 In order to reduce any collateral damage to the surroundings these jets are often made very small (thousandths of an inch in diameter) so that their range is short, and they are inclined outward to cut to the edges of the confining shield. We have had some success in turning those angles the other way, so that they cut into the shield, rather than away from the center, and also so that each jet is directed towards the path of the next jet around the circumference. The intent in this case is to allow the use of a slightly larger jet, with a greater cutting range. In this case the individual cleaning/cutting path is a little larger, but because the jet at then end of the cut moves into the range of the adjacent jet, then any remaining energy that it and the dislodged debris still have, will not be enough to get through this second jet. Figure 5. Inclined jet and shroud design. The action of each jet then becomes not only to cut into and remove material, but also to contain the spent material from the other jets dispersed around the cutting arm, and to hold the debris in the center of the confinement for the very short time needed for it to be caught up in the vacuum line. In all cases the choice of pressure, nozzle size, and operational factors such as angle of attack, come down to the target materials, those that have to be removed, and those that need to be left undamaged. And it is why it is useful, at the start of any new job, to take the time to do a little testing first, to make sure that the right choices of nozzle and angle have been made to get the job done quickly and efficiently. 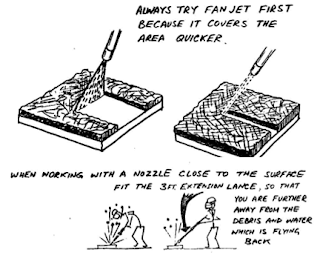 Incidentally the idea behind the test of effective pressure, that the jet flows laterally when it hits something it can’t cut, can help, for example in easing the meat from the bone when a jet cuts a deer leg. Figure 6. 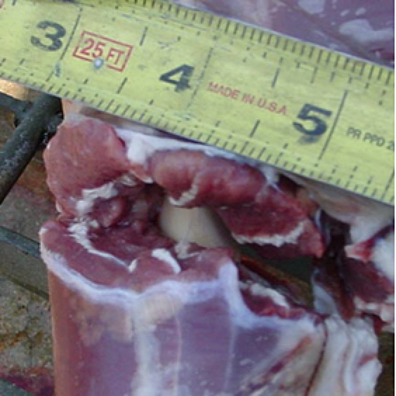 Cut across a deer leg, note how the jet has cleaned off the meat from the bone, undercutting the flesh. Did you know you can shorten your links with AdFly and make money for every click on your shortened urls.